← So…Saint George and Princess Sabra: They Go Together eh? Two weeks ago, I discovered, to my dismay, that my trusty point-and-shoot Canon camera (pictured above) was missing. I carry it all the time in my bag and coincidentally, on that day, I wanted to use it but could not find it. I searched in all the usual (and unusual) places, and lamented in all the usual places too…Twitter, Facebook…you name it. I even called my parents and parents-in-law in Ipoh and Taiping to help look, because I definitely brought it along with me during the Chinese New Year break. The last time I remember using it was on CNY eve when I had downloaded some photos into my laptop. I was using the camera and laptop in the room in Taiping and because it was late at night at that time, I had an inkling that I might have dropped it somewhere in the room. Also, I didn’t remember using it at all after that. My MIL helped me look in the room, under the bed, and even all around the house, but each time, she would report to tell me it could not be found. Apparently my SIL had also cleaned out the room, including changing the bedsheets but she did not recall finding anything too. My parents could not find it in Ipoh as well. Hope was running out, and I was beginning to believe that I might have accidentally dropped it in some restaurant or mall…!! I searched every nook and cranny in my apartment in Penang, but nothing was found. Every time I go to a restaurant or store which I had gone to since I came back from CNY, I would ask the people working there if they had found a camera. But each time, they shook their heads and told me no. Old Town, Fatty Loh Chicken Rice, Popular bookstore, Daiso, the kids’ school, everywhere..
Hubby had also thought that I might have accidentally THROWN it away in the trash!!! Gawsh. But…as you can see from the title, I DID finally find it….but where? In my quest to find it, there were people who would tell me that the camera would inevitably appear when I least expect it. But in my case, it appeared where I *thought* it would be. 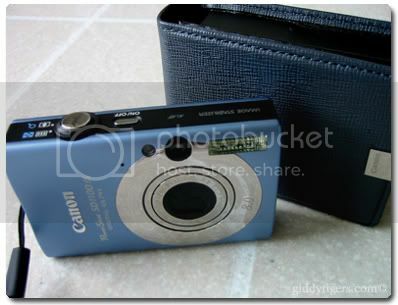 About 2 weeks into my search, I hunted for a photo of my camera and emailed it to my Mom in Ipoh, to aid her search. It was that picture right at the top of this post. But as I did so, the image of that camera stuck in my mind. I was so affected by that image that I could not think straight, and could not even sleep! I know it sounds weird, but it was as if my camera was calling out to me from wherever it was. I was so fixated by it, that I kept thinking and focusing on it even more than before. And the answer I received was crystal clear. The camera was in Taiping all along. So sure was I that it was in Taiping, that I asked my MIL to look again. It was a pretty small camera, and I was afraid it might have been overlooked. However, when I contacted MIL to look again, she said she still could not find it. But I stubbornly refused to believe it, and because I wanted to appease myself, I persuaded hubby to make a day trip to Taiping last weekend. My eyes furtively searched the living room as I stepped into the house, but could find nothing. Couch, piano, kitchen dining room: nothing. My hubby said he briefly looked in his room, but there was no camera to be found either. We went out for lunch and came back about an hour later. Hannah wanted to lie down, so I went upstairs with her. We were in my SIL’s room for a while and then Hannah wanted to go downstairs again. So I told her to wait a while, while I went to look for my camera in the other room (her Daddy’s room). As I opened the door, I did not know what to expect, but I knew it was gonna be quite fast looking for it, because my hubby’s room was not cluttered with a lot of things. Instinctively I walked towards the cabinet at the far end of the room and lo and behold, what should I see but my dark grey camera case with my camera inside, lying on the floor, just peeping out from under the cabinet! I let out a scream a joy, grabbed hold of it with dear life, and practically ran downstairs, proudly proclaiming my find. My hubby and MIL were so surprised that I had found it, and I led them to the exact spot where the camera was. Well, let’s just say I was literally jumping up and down at this point. For some reason, nobody saw it when they were looking for it in the room. Not when it was being swept and mopped and vacuumed. Not when my hubby did a last check before we left Taiping during CNY. This entry was posted in Close to Heart & Home, Thoughts & Scribblings and tagged camera, lost, peculiar, thoughts. Bookmark the permalink. The Giddy Tigress says: Oh yeah…right….every reason to bring in the food eh? Hurray to a precious camera found! I will be like u as well, if I misplaced my camera. Usually I find that whenever I lose something important, just need to pray for God’s help to find it, and somehow, it will re-surface somewhere again.